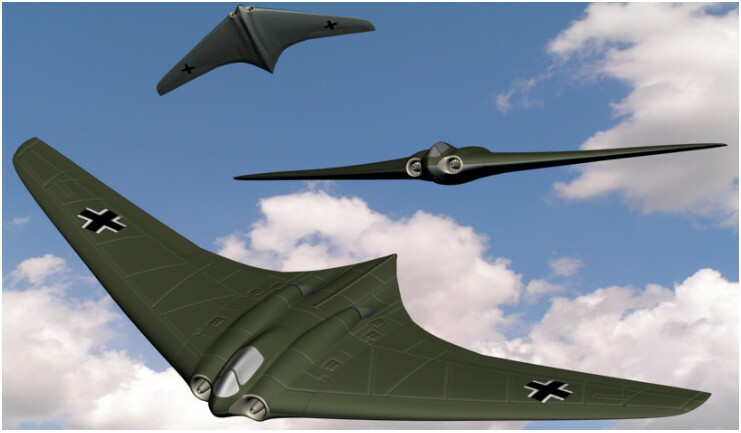 In Part 2 of this 3ds Max tutorial, we will Texture Map the German WII HO 229 flying wing model, and use the Unwrap UVW modifier to lay out the surface areas of the model. 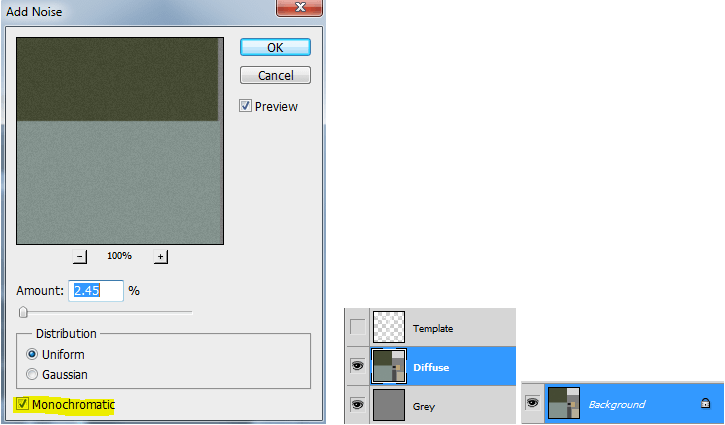 Then render the layout to a PNG template to use in your paint program. This will bring the model visually to life. 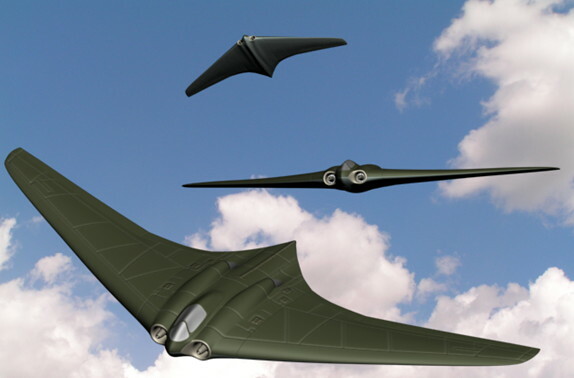 Finally, we will Render a scene of the Flying Wing with a cloudy sky background. Add more edge loops to support the geometry of the Canopy. 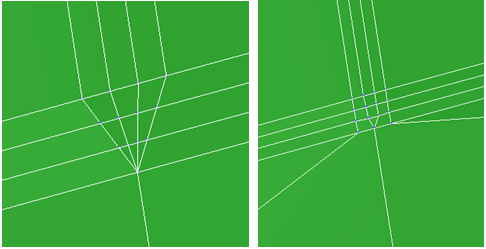 In Vertex mode adjust all new points against the background images, in each viewport. Chamfer the canopy edges. Fix as many 3 point poly’s as you can. Chamfer the Edges behind the jet engine outlet. In Vertex mode use Move to adjust the points until there is a curved dip. 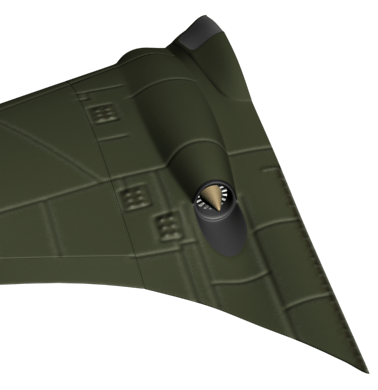 Chamfer at .10 with 3 segments where the wing flaps and wing separation are in the background image on both sides of the wing. Chamfering at 3 Segments can cause a few messy spots to fix before using TurboSmooth. Some tools to make it easier: Target Weld, Remove Edge, or Collapse Vertices. We want to reduce the 3 point and 5 point poly’s as much as possible to avoid odd subdivisions that give unexpected results with the TurboSmooth modifier on. Four point poly’s divide nicely into 4 then 8 then 16 point poly’s…ect. 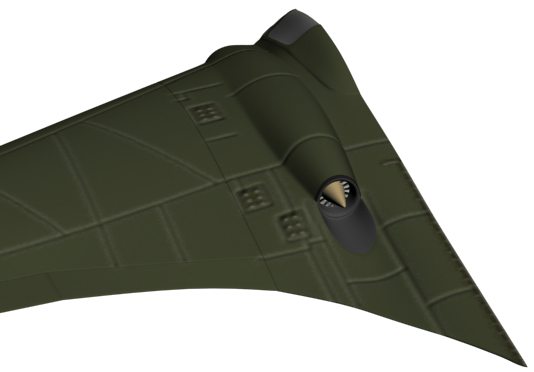 Go to Polygon mode and select all the new poly’s in the middle of the chamfered edge loop on both sides of the wing. Go to Extrude, Local Normal at -0.02. This will indent the poly selection. Turn on Turbosmooth and check both sides of the wing. In Polygon mode, use the Scale button to make the nacelle more narrow. 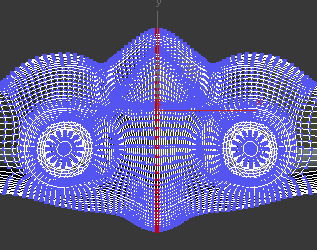 Inset the outer poly, then negativeExtrude just a bit. Check things with Turbosmooth on. Click the Mirror button on the toolbar. Move the two halves together, and Weld the middle points. Select the shown poly’s. Go to Extrude, Group at 0.05. 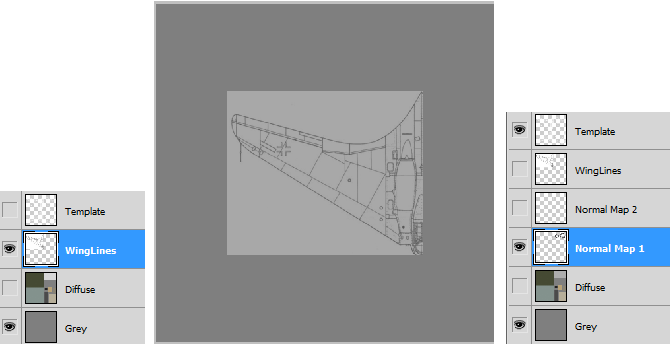 This will raise the non glass canopy area up a bit, which will show well in Turbosmooth. Put the TurboSmooth to 2 iterations. 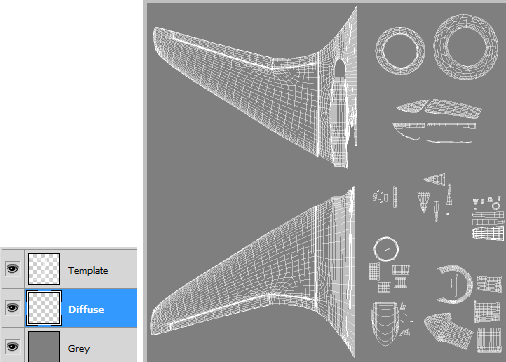 This will make it easier to select poly’s for your parts layout because the mesh will not be so dense. Right click to Collapse the stack. 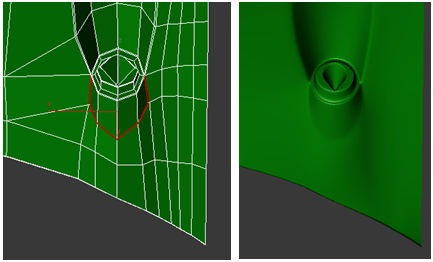 Then convert from Mesh to Poly. Select and Delete half of the wing. We are in high poly mode now. We will work with one half so we do not have double the number of surface areas to UVW map. We will Mirror another half after the UVW mapping. 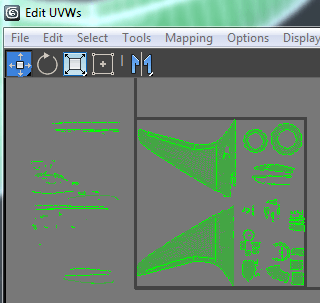 This will create overlapping of the mirrored half in the UV parts layout. Put a Unwrap UVW modifier on the stack. 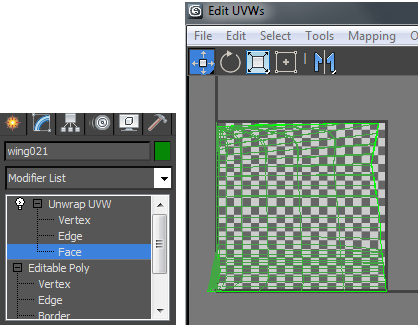 Stay in Face mode then click the Editor button to open the Edit UVWs dialog box. 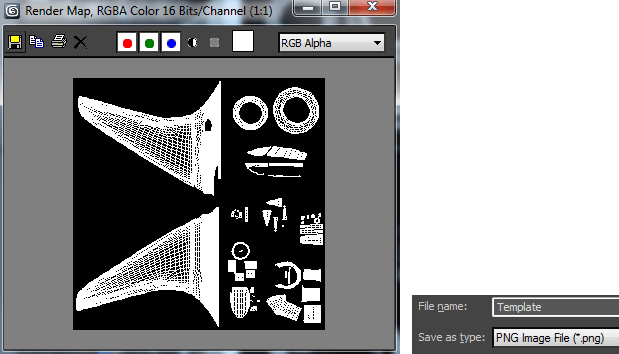 All the objects surface areas are jumbled in the box and have to be UV mapped so we can put a texture on it. Select all the poly’s in the box. 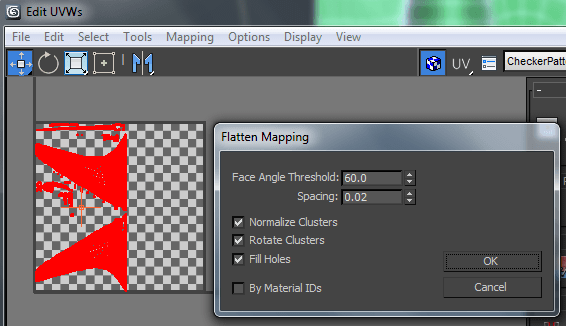 Then go to Mapping/Flatten Mapping.Angle at 60 degrees to minimize the number of pieces. Move all the parts outside the box. Group select all the poly’s that make the flat polygons of the jet engines inlet and outlet. 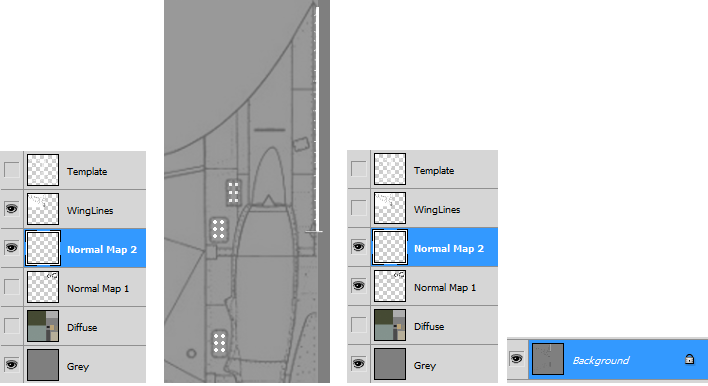 Go to the Quick Planar Map button. 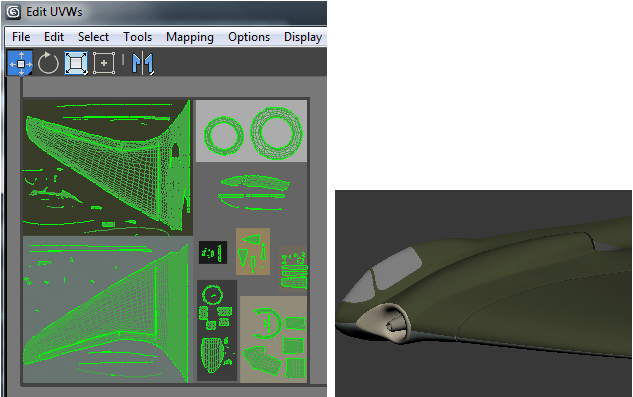 We will use this for the Normal Map texture to create the compressor and turbine blades. Move these pieces to an empty spot outside the box in the Edit UVW window. Group select all the poly’s that make the rear nozzle of the jet engine. Go to Tools/Break, then move them outside the box. Start moving related pieces into groups. Below we have some of the outlet pieces clustered outside the box. Continue the process with the rest of the jet outlet parts. Select the inlet cone poly’s. Go to Tools/Break, then move and organize and group outside the box. Do the same process with the poly’s that make the rest of the inlet. Keep all the jet inlet/outlet pieces in one group of parts. Select the window poly’s. Put the pieces in an empty spot. Rearrange the rest of the parts in Select By Element/Face mode. Move the wings and body into the box. Scale up or down some of the parts. Place them to the right of the wings. Leave the rest of the tiny parts outside the box for now. 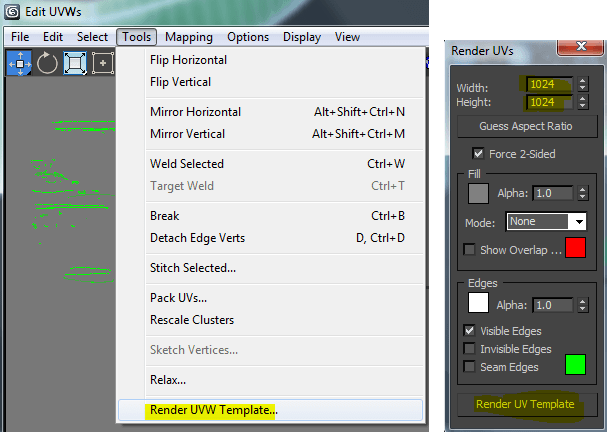 In the UVWs box, go to Tools/ Render UVW Template. Go to the Save button and save as a PNG file. Name the file Template. Open the Template.PNG file into a paint program. Put a layer above the Gray layer, name it Diffuse. On the Diffuse layer, start to use the Rectangular selection to put different colors on related groups of parts. 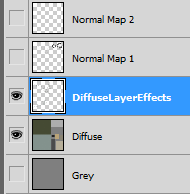 Add Noise to the Diffuse layer under Filter on the menu. Turn off the Template layer, and right click to Flatten the stack. Save as Diffuse.TGA. This is your test Diffuse(color) map. 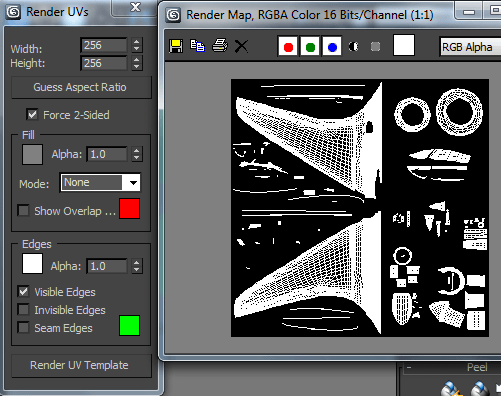 Go back to 3ds Max, pick a Material slot, then load the Diffuse.tga file into the Diffuse Color under Maps. You will see the model has spotty coloring. 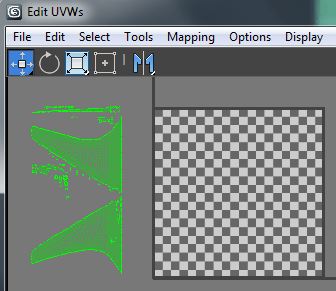 This is caused by all the surface areas left outside the box in the Edit UVWs window. These leftover pieces belong in the top or bottom wing texture area. The top, bottom wings and body pieces we will divide. Green for the top. Gray for the bottom. 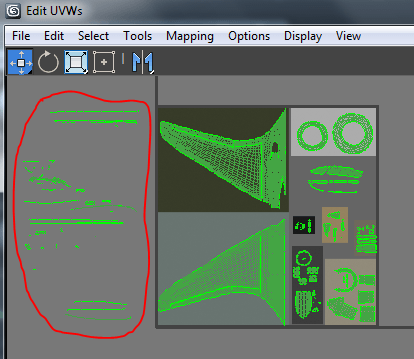 So any non green poly’s you see on the top of the model, have to selected, then Tools/Break, then move those pieces to the green texture area on the top wing in the Edit UVWs box. Watch in the Perspectives window to see the highlighted poly’s. All the pieces are now separated in the box. 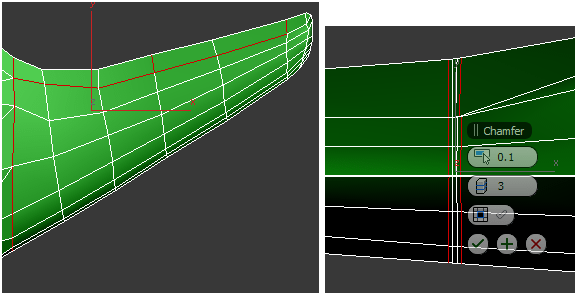 Each piece for the top half of the model is in the green area of the Diffuse Map. 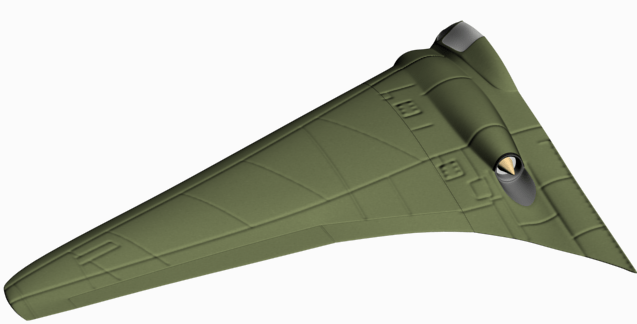 Each piece for the bottom half of the model is in the gray area of the Diffuse Map. 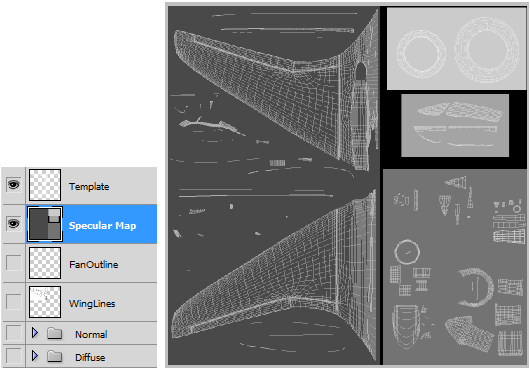 Check the model for any misplaced pieces. Create a new Template now that all the parts are in the box. A Normal map will bring a lot of extra 3D detail to the model. Just remember that the darker the gray, the more indented the effect on the model in 3ds Max, and the lighter the gray the more extruded the effect will be. Import WingLines.PNG as a new layer. Move it under the template layer. Bring the Opacity down. Turn on the Template layer. Create two Normal Map layers. This is for the Normal Map 1 layer. 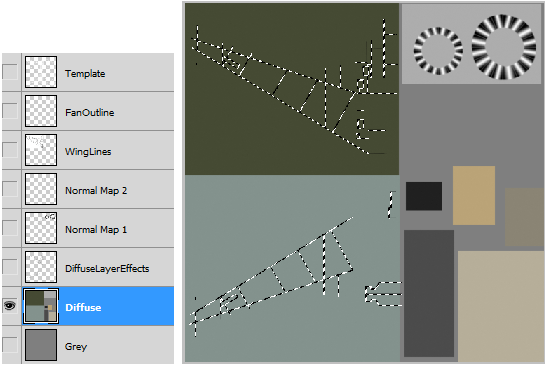 Turn on the WingLines layer and use the Move tool to move the image over the top wing. Use a one pixel size brush to draw enough detail. Black will indent and white will pop out a bit on the model when we convert to a Normal map. Go to the WingLines layer. On the Menu go to Edit/Transform Flip Vertical. Then Move it down to the bottom wing. Draw the wing lines and create lines for the landing gear hatches. This is for the Normal Map 2 layer. Use a white Paint Brush to create rivets and the extruded areas of the tail. Then turn off WingLines layer. Turn on both Normal Map layers. Flatten the stack. Then go to the Normal Map filter, 4 Sample, Scale 15. Click OK. Then Blur the Image under Filter on the menu. Go back to 3ds Max, in the same Material, select the Bump. Click None. Click Normal Bump. Then click None. Select Bitmap and load the Normal.tga file. 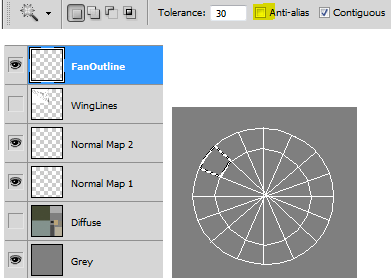 Add a new layer above the Normal Map layer for the fan blades, which we will add to help make the gradients to simulate fan and turbine blades. Use the Template layer as a background while using a White Pencil draw and stroke two ovals, and hold Shift to draw straight diagonal lines. Go to Magic Wand and turn off Anti-alias. 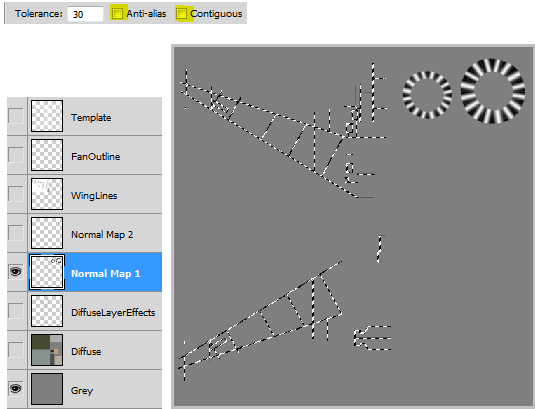 Use the FanOutline layer with the Magic Wand to make a selection for a blade piece. 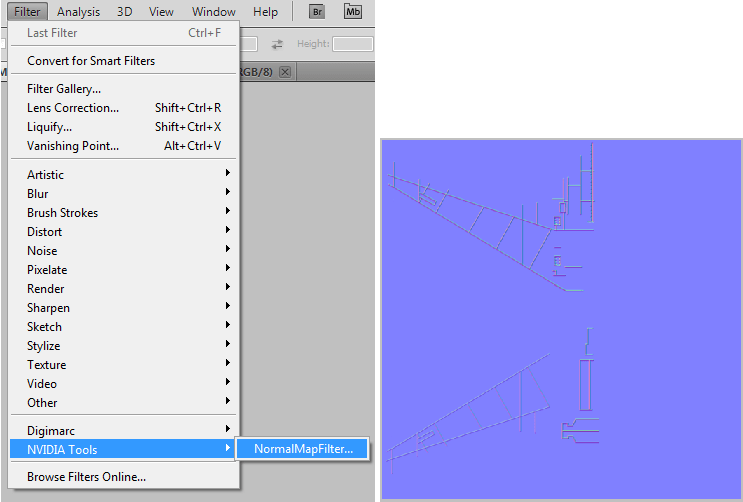 Turn off the FanOutline layer and click the Normal Map 1 layer. Go to Gradient on the toolbar and choose Reflected Gradient. Draw the gradient. Continue the process between the two layers until all blades are finished. When done, put a square selection over the fan in the Normal Map 1 layer, and Blur/Blur More. Follow the same process for the front Fan blades. Turn off the FanOutline layer. Collapse the stack and convert to a Normal map and Blur. Save as a Normal.tga. Make sure the Normal map is loaded, then check the results in 3ds Max. Undo to get back to your project. Create a new layer DiffuseLayerEffects. Turn on the layer DiffuseLayerEffects. On the Menu, go to Layer/Layer Style/Inner Glow. Color brown, Overlay, low opacity. This will simulate dirt. Then go to Layer/Layer Style/Outer Glow. Color gray, Screen, Low Opacity and Noise. This will simulate chipped paint. Go to Normal Map 1. Use the Magic Wand to click any gray area. Turn offAnti-alias and Contiguous. Then from the menu, Select/Inverse.Use the Rectangular selection tool and hold the ALT to deselect the fans. Then go to the the Diffuse layer, then Edit/Copy. You have a copy from the Diffuse layer inside the selection. 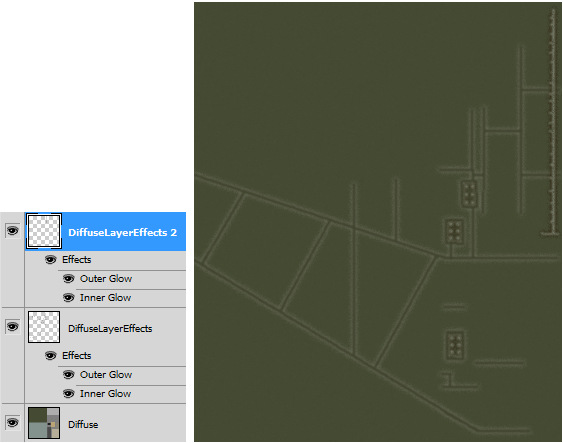 Go to the DiffuseLayerEffects layer then Copy/Paste in Place. Then Filter/Blur/Blur More. This is from Normal Map 2, the extruded areas like the rivits and tail piece. 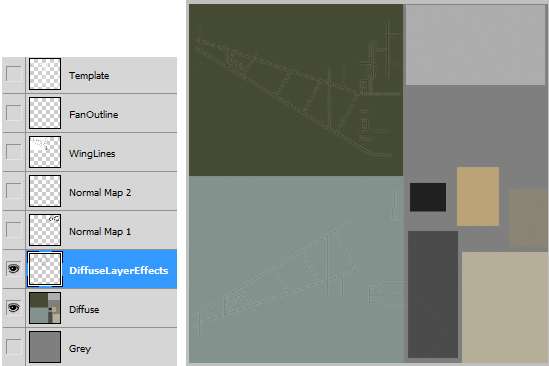 Create a new layer DiffuseLayerEffects 2. Follow the same steps as above except reverse the settings for Inner Glow and Outer Glow. Right click to flatten Image and save as Diffuse.tga. Make sure the Diffuse map is loaded, then check the results in 3ds Max. The basics of a Specular map is that black blocks all reflection, gray not so much, and white gives full reflection. So on our specular map we will make it simple. The parts we want to give more reflection are brighter. On the Specular layer the body and wings are the darkest, but will still give a bit of shine. The turbine/fan are the brightest because we want them to look like shiny steel. Make sure the Specular map is loaded, then check the results in 3ds Max. 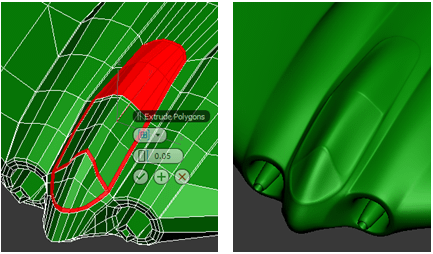 In 3ds Max, right click to collapse to Editable Poly. On the toolbar click Mirror. Then move the copy to line up. Click Attach to make both pieces one object. In Vertex mode weld the two Elements together.Use Weld very carefully around the chamfered areas around the canopy. The Mirrored side UV parts all overlap perfectly. So the Texture Maps will look the same on both sides. From the menu go to Views/Viewport Background/Viewport Background. Go to Files and load the background image. Back to the menu, go to Views/Viewport Background, then check Show Background in the sub menu. Then under Rendering on the menu go to Render. Click the Environment and Effects button. Load the same background image and then check Use Map. Use the Move tool to Shift Clone 2 copies of the flying wing. Use the Scale button on the toolbar to scale down the Cloned wings. Rotate and Move both cloned wings until it looks right. A clear canopy with instrument panel. Landing gear. Then a still render on the tarmac.